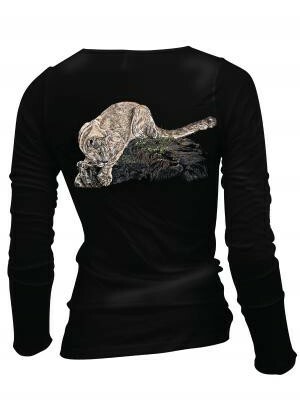 This black long sleeve tee is made of 100% sheer jersey cotton, made in the USA, with a subtle stretch and delicate texture, pre-shrunk and laundered, and combed for softness. The Larry Ormsby illustration of a wild cougar is on the back; a small Cougar Fund logo is on the front left chest and “THE COUGAR FUND” runs down the right sleeve. The women’s style has Merrow stitch neckband and cuffs and has a trim fit. The men’s style has a durable rib neckband and cuffs.